Flip on the television any day of the week and it’s likely you will hear various experts discussing the health care situation in the United States. These are all critical, relevant questions with complicated, multi-layered answers. Honor Community Health — an organization established in 2012 to deliver high-quality care to patients experiencing some of these issues — is doing its very best to fill in the gaps wherever they can. As a Federally Qualified Health Center (FQHC), grants are received via state and federal government to help serve many of the uninsured or those on Medicaid. 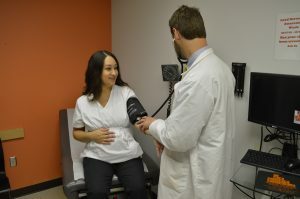 The organization has grown from a single location in Pontiac to now operating 11 different community health centers throughout Oakland County. One of the physicians that treats patients at the Baldwin Family Medicine Center in Pontiac is Dr. Latoya Austin. In May of 2017, she was named the associate medical director for Honor Community Health. Austin and other physicians with Honor Community Health are trained to handle services similar to that of a gynecologist. Services offered include prenatal care, common gynecological procedures, and non-surgical treatments for a number of women’s health concerns. In addition, Erica Partee joined the Honor team last August as the homeless program manager after over a decade of experience working in that field. Dr. Sadeer Peter and Dr. Jason Ramos are among a gifted group of physicians treating patients at Honor’s Family Medicine Center in Pontiac. All are key components of an organization committed to helping as many people as possible using every resource they possess. Honor Community Health looks to continue serving those in need for many years to come.